The Dell Inspiron Duo is an innovative new portable machine that combines typical netbook capabilities with a touchscreen, making it one of the cheaper true tablet pc's currently on the market. As a netbook, the device performs well. The screen is bright and easy to read, with good depth of colour. The high definition resolution makes it a pleasure to work with on a day to day basis. The keyboard is nicely laid out for a netbook, and subject to the usual issues with small devices of cramped arrow buttons etc, is well designed. As a tablet PC, the weight of the machine becomes quite quickly noticable, making it difficult to operate with one hand, and hold with the other. This means that you tend to find yourself looking for somewhere to perch it whilst you use it. This leads to the other irritation - the screen viewing angles are not as good as they could be, and do not compare well with other tablet devices such as the ipad. The hardware spec for the machine is good for a netbook, with the processor capable of handling multiple internet browsing windows with ease, as well as other media functions typically associated with netbooks. The additional broadcom crystal HD accelerator also allows the device to punch above its weight with video playback. Nonetheless, the speed of the machine quickly becomes evident on any more demanding processes, reminding you that this is a netbook, and not a replacement for a desktop PC. The inclusion of 2Gb of Memory is welcome as standard specification, though note that further upgrade of this is not easily achieved. Battery life is poor on the machine, with it only managing about 3 hours with normal every day use. You may be able to tweak this out a little longer with conservative power settings, though it will never compare well with other netbooks. In addition, there is no external battery, which means that swapping battery packs will not be an alternative solution for the intensive user. For people like myself who use it around the house, this is not a particular issue, as a power supply or the docking station is never far away. The machine has very little in the way of external ports. There is no HDMI or VGA output on either the machine or the dock. Likewise, there is no media card reader on the main machine, though the dock does incorporate one, providing an alternative that many may find unacceptable. I have resolve this by buying a small USB Card reader that I have when required, as I find myself rarely needing to import or export files by card to the netbook. The biggest irritation with the machine is that despite the website claims to the contrary, the UK/ European specification does NOT include a sim card reader. This means that the only way to connect to the internet where WIFI is not present is by tethering to a mobile phone. Windows does perform this task well, but it really shouldnt be necessary, and some critism should be levelled at Dell for not providing this from the outset. Dissapointingly when confronted with this, Dell merely offered their apologies, and my money back. I would have much preferred the offer of either an appropriate upgrade now, or at least when it becomes available in the future. In a word, little to none. The device has not been designed to be upgraded. Some upgrades are not impossible, and I am aware of people who have already swapped out the hard drive for SSD models. The Dock station is a welcome addition, and allows me to use the machine easily to watch movies in the kitchen, leaving the screen at the right angle to easily read recipes etc. The speakers however are not high quality, and whilst they are better than the average netbook speakers, one cannot help feeling that they could and should have been sizeably better than they are. The dock would not compare well with a similarly priced dock for the Apple equivalent device, but it is noteworthy that it does add the provision of a card reader, as well as a Local Area Network socket. There is no VGA connector on the dock, so those needing this will remain dissapointed. The Dell Inspiron Duo comes with Windows Premium 32bit pre-installed. There is currently no option to install the 64bit version of the software prior to purchase, and I am not aware of any reason why the netbook shouldn't run it just fine. 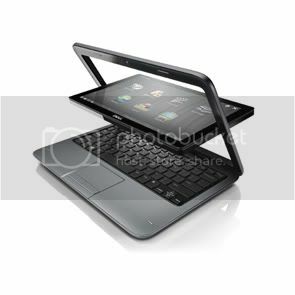 In tablet mode, Dell have bundled their own media based software to facilitate operation of the machine. My advice is that you should bin it quickly. It is buggy, and I find that the video playback is jerky at best. Windows Media Player makes a better job of playback currently, though hopefully this will be addressed with future software updates. Microsoft have provided multi-touch support within Windows 7, allowing the user to perform most touch based operations as one has come to expect of a tablet device. Additionally, Explorer provides increased space between lines of writing (for example on favourites) in an attempt to allow you to make your selection more accurately. The keyboard interface works reasonably well, though it would not hurt for it to automatically load when one taps a text box similar to the Apple equivalent. Despite the above, there are still issues with the operation. The multi-touch zoon is far too sensitive, and the lag makes it very difficult to operate. Likewise, scrolling down websites is very jerky, and compares very poorly to the ipad and other tablet devices. Rotation between portrait and landscape is very slow, and needs to be improved. Whilst the resolution of the above issues would be most welcome, they do not make the use of the device impossible. I use it regularly for surfing the web, and it performs okay. The real problem is that Windows 7 is not designed to be a predominantly touch-screen interface. This is never more apparent than when seeking out software to take advantage of the Dell Inspiron Duos tablet mode. That said, unless software writers are suitably motivated to create software that make use of the tablet mode, the full potential of this hardware format may never be truly realised. One interesting solution to this may be a dual boot configuration with a touch based operating system. I have experimented with Android x86 2.2, an open sourced project attempting to provide the increasingly popular Android platform on Intel based devices. Even running the software from a bootable USB stick (as opposed to formally installing it), the merits of this are quickly apparent even to me as a relative layman, with the touch interface significantly improved. At the moment, the software isnt really there yet, with a number of fundamental bugs that need to be resolved. But a reliable version of this software is a really exciting prospect, and the clever guys and gals behind the Android X86 project (as well as all those that contribute) are to be commended for their ongoing efforts. Perhaps Dell would be well advised to spend their money providing funding to this, as opposed to writing their own bespoke software to be run from within Windows, though one suspects that the close relationship between Dell and Microsoft will prevent this from ever happening. Dell should be commended for coming up with a truly innovative platform that combines a cost effective unit providing netbook and some tablet capabilities. Nevertheless, the unit is not achieving its full potential, mainly because the software is not written to capitalise on this clever hardware format. Dell have attempted to resolve this issue by providing some bespoke software written within windows that currenlty does not do a great job. It is my opinion that the device would be better served by being dual boot, combining Windows 7 with Android, or another purely touch screen based interface. Until such time, it will likely fall into a rather small niche market, unlikely to tempt people away from the more accomplished 'slate' format offerings from the likes of Apple and Samsung, and many netbook users may not be tempted to spend the additional money for the tablet capabilities in their current form. Even so, I love mine and use it all the time. Despite its faults, the fact that it is different appeals greatly to me, and the flexibility of the dual format compensates me for many of its failings. I can partly explain this because I am quite prepared to play with beta software and experimental software such as the Android X86. This is not everyones cup of tea, but for me, it is part of the excitement of the format. Moreover, the ability to 'fiddle' is one of my fundamental requirements of a machine. It does not hurt that it is rare. In a world where everybody is jumping on the Apple Bandwagon, be different - buy a PC! Dell Mini 1012 (Obsidian Black), WinXp SP3, 2gb RAM, 1.66ghz 512K L2 (N450) processor, A04 BIOS, 640gb WD Hard Drive, Intel NM10 Express Graphics, 1.3mp Camera, 1366X768 LCD Panel, Wireless 802.11n (HB95) mini card, 6 cell (56WHr) Battery. Trackman Wheel, AT&T USBConnect Velocity Broadband USB Modem.